Dr. Rajan’s treatement is very good but the only thing I hate is waiting time. There were only 3 patients beforeme and it took me more than one hour wait time. This is the only reason for me to not come back here. Dr. Rajan’s treatement is very good but the only thing I hate is waiting time. There were only 3 patients before me and it took me more than one hour waittime. This is the only reason for me to not come back here. Loved my visit with Dr. Patel. He gives great advice. Seems like a patient individual. Very knowledgeable and is happy toanswer any questions that you have. I had a good experience overall. Loved my visit with Dr. Patel. He gives great advice. Seems like a patient individual. Very knowledgeable and is happy to answer any questions that you have. I had a goodexperience overall. we see all ages above 10. Excellent visit. Doctor was attentive, helpful and thorough. Very intelligent and caring. Took his time to answer my questions. Highly recommended. Dr. Patel was very knowledgeable and helpful. I will definitely be returning. Very nice and professional. Was in and out quickly. no use in booking an appointment. it all first come and first service. Dr. Patel was very professional and caring. He was incredibly sexist, belittling, elitist and unprofessional. People were coming into the room while I was trying to talk to the doctor and I was not taken seriously at all. It was humiliating. I will never go here again. Friendly, responsive, and knowledgeable. Trusted me and asked questions related to my concerns. Dr. Patel listened my concerns with patience. He explains in very clear terms what happened and what needs to be done/recovery period/instructions. I have visited him 3-4 times so far, and every time his diagnosis and treatment have been spot on. Personable, friendly, knowledgeable, and has a great bedside manner. Highly recommend. Upon entering the office, I was taken aback. The couch in the waiting room was filthy. The dirt was easily visible, and I cringed at the thought of having to sit there. Fortunately, there were other chairs to sit in, whichcould also use some cleaning. The look of the office was extremely outdated, and I questioned whether I should move forward with my appointment. The front desk woman was ok. Not so friendly...not a smile in sight. However, Dr. Patel was very professional and warm. I would highly recommend that they put that couch out on the next bulk trash day and invest in a new one. It would make a world of difference. It was really disgusting. De. Patel was very warm and welcoming. Made my 16 year old feel comfortable during the visit. He made time to answer all our questions and showed genuine interest. He also seemed extremely knowledgeable, I'm very happy we were able tosee him on such short notice. Thank you Dr. Patel! First time visit seems great. That doctor is very good. This doctor is a very professional and caring physician. I highly recommend him to anyone seeking a physician with his knowledge and expertise. I have seen him over 6 years and he has taken care of our entire family. Very nice office staff. Doctor answered all questions and was very patient and kind. Went for a routine physical. Whole appointment was about 10 minutes. Checked my blood pressure, pulse, and looked into my eyes, ears, and throat. Didn't check reflexes, for a hernia, or my prostate (not that I was looking forward to that,but being over 50, that has been standard operating procedure for my other physicals. Will wait for follow up after my blood work is done and completed. Very professional. Extremely convenient making appointments on Zocdoc along with text reminders of appointments. I take my elderly mother to Dr Patel since he is a Doctor who specializes in caring for the elderly. He is the greatest! Listens, compassionate, and has personality. Very thorough! I like him. I will probably use him as my primary. He did like 5 blood tests. I went to get my blood tested and not even two days later he called me with the results. Dr Patel & his wife are always calm and friendly. Wait time there is always shorter than any other doctor I've ever seen. Would definitely recommend. It was great! I was seen right away and Doctor Patel thoroughly went through every topic that I brought to his attention! Highly Recommend! Dr. Patel is very kind and helpful. Listens to his patients and genuinely cares. Office looks a bit grungy - don't be offput by this. He is a wonderful GP! Dr. Patel is very nice, and his bedside manner is very professional. I typically have a smooth visit at this office, but on my most recent visit I waited over 30 minutes to be seen for my appointment. The waiting roomwas loud, with one patient even playing music from his phone in the waiting room. I'll continue to see this doctor, but hope this long wait was only an isolated incident. Doctor was great ... office is outdated. He is a good doctor and I would recommend him. My visit was professional and very helpful. Dr Patel is an excellent doctor. You never feel that you are "on-the-clock" when you are with him. He asks all the right questions and actually listens to your responses. He puts you at ease right from the get-go and throughoutyour entire visit. Also, the ease of scheduling an appointment is fantastic. 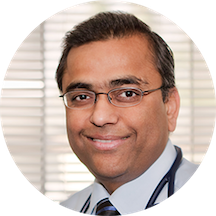 Dr. Patel treats you with dignity, respect, and compassion. Excellent experience, and I would recommend him to all of my family and friends. I love that Dr. Patel has Saturday hours. It is so convenient. Listens very well to all of my complaints. Very compassionate! I would recommend this doctor to anyone.! Very friendly and personable, great experience.